In this book, Cal Newport seeks to answer a simple question: Why do some people end up loving what they do, while so many others fail at this goal? 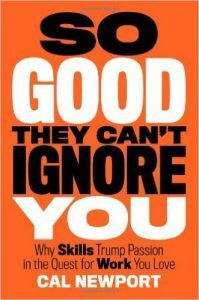 Newport believes that “following your passion” is bad advice and instead argues that it’s better to focus on developing your ability so you can “be so good they can’t ignore you.” I loved this book and plan to review these notes on a regular basis. You can buy a copy here in Amazon. Do What Steve Jobs Did, Not What He Said. What makes Roadtrip Nation relevant is that it maintains an extensive video library of the interviews conducted for the project1. There’s perhaps no better single resource for diving into the reality of how people end up with compelling careers. “In the movies there’s this idea that you should just go for your dream,” Ira Glass tells them. “But I don’t believe that. Things happen in stages.” Glass emphasizes that it takes time to get good at anything, recounting the many years it took him to master radio to the point where he had interesting options. “The key thing is to force yourself through the work, force the skills to come; that’s the hardest phase,” he says. Her breakthrough paper, published in the Journal of Research in Personality while she was still a graduate student, explores the distinction between a job, a career, and a calling. A job, in Wrzesniewski’s formulation, is a way to pay the bills, a career is a path toward increasingly better work, and a calling is work that’s an important part of your life and a vital part of your identity. In Wrzesniewski’s research, the happiest, most passionate employees are not those who followed their passion into a position, but instead those who have been around long enough to become good at what they do. The Clarity of the Craftsman In which I introduce two different approaches to thinking about work: the craftsman mindset, a focus on what value you’re producing in your job, and the passion mindset, a focus on what value your job offers you. Most people adopt the passion mindset, but in this chapter I argue that the craftsman mindset is the foundation for creating work you love. Inspired, I turned my attention from my website to a habit that continues to this day: I track the hours spent each month dedicated to thinking hard about research problems (in the month in which I first wrote this chapter, for example, I dedicated forty-two hours to these core tasks). there’s something liberating about the craftsman mindset: It asks you to leave behind self-centered concerns about whether your job is “just right,” and instead put your head down and plug away at getting really damn good. No one owes you a great career, it argues; you need to earn it—and the process won’t be easy. The downside of the passion mindset is that it strips away merit. For passion proponents like Slim, launching a freelance career that gives you control, creativity, and impact is easy—it’s just the act of getting started that trips us up. Career capital theory disagrees. It tells us that great work doesn’t just require great courage, but also skills of great (and real) value. When Feuer left her advertising career to start a yoga studio, not only did she discard the career capital acquired over many years in the marketing industry, but she transitioned into an unrelated field where she had almost no capital. What makes television a hard industry to crack is the fact that it’s a winner-take-all market. There’s only one type of career capital here, the quality of your writing, and there are thousands of hopefuls trying to gain enough of this capital to impress a very small group of buyers. In debate, as in television writing, there’s no mystery about what separates good from bad: The scoring system is specific and known. To become the country’s best debater, therefore, Alex had to master the art of continual improvement. If you want to understand the science of how people get good at something, chess is an excellent place to start. For one thing, it provides a clear definition of ability: your ranking. In 2005, a research team led by Neil Charness, a psychologist from Florida State University, published the results of a decades-long investigation of the practice habits of chess players. Previous studies had shown it takes around ten years, at minimum, to become a grand master. Hours spent in serious study of the game was not just the most important factor in predicting chess skill, it dominated the other factors. The researchers discovered that the players who became grand masters spent five times more hours dedicated to serious study than those who plateaued at an intermediate level. The grand masters, on average, dedicated around 5,000 hours out of their 10,000 to serious study. The intermediate players, by contrast, dedicated only around 1,000 to this activity. The Norwegian chess phenom Magnus Carlsen, for example, paid Garry Kasparov over $700,000 a year to add polish to his otherwise intuitive playing style. If you can figure out how to integrate deliberate practice into your own life, you have the possibility of blowing past your peers in your value, as you’ll likely be alone in your dedication to systematically getting better. That is, deliberate practice might provide the key to quickly becoming so good they can’t ignore you. In his memoir, Martin expounds on this idea when he discusses the importance of “diligence” for his success in the entertainment business. What’s interesting is that Martin redefines the word so that it’s less about paying attention to your main pursuit, and more about your willingness to ignore other pursuits that pop up along the way to distract you. The final step for applying deliberate practice to your working life is to adopt this style of diligence. Jane’s story, for example, is just one of many from the growing lifestyle-design community. This movement argues that you don’t have to live life by other people’s rules. It encourages its followers to design their own path through life—preferably one that’s exciting and enjoyable to live. It’s easy to find examples of this philosophy in action, because many of its disciples blog about their exploits. The “business” he referenced, as is the case with many lifestyle designers, was his blog about being a lifestyle designer. In other words, his only product was his enthusiasm about not having a “normal” life. It doesn’t take an economist to point out there’s not much real value lurking there. The Power of Mission To have a mission is to have a unifying focus for your career. It’s more general than a specific job and can span multiple positions. It provides an answer to the question, What should I do with my life? Missions are powerful because they focus your energy toward a useful goal, and this in turn maximizes your impact on your world—a crucial factor in loving what you do. A good career mission is similar to a scientific breakthrough—it’s an innovation waiting to be discovered in the adjacent possible of your field. If you want to identify a mission for your working life, therefore, you must first get to the cutting edge—the only place where these missions become visible. This insight explains Sarah’s struggles: She was trying to find a mission before she got to the cutting edge (she was still in her first two years as a graduate student when she began to panic about her lack of focus). It was at Oxford that Pardis decided that Africa and infectious diseases were also a potentially interesting topic to study. If you’re keeping count, this was the third field that at some point in her student career attracted her—the full list now contains math, medicine, and infectious disease. This is why she’s wary of the strategy of trying to identify your one true calling in advance—in her experience, lots of different things can, at different times, seem compelling. Kirk’s path to American Treasures was incremental. He didn’t decide out of nowhere that he wanted to host a television show and then work backward to make that dream a reality. Instead, he worked forward from his original mission—to popularize archaeology—with a series of small, almost tentative steps. Giles, however, adds another layer of nuance to this goal. He approached the task of finding good projects for his mission with the mindset of a marketer, systematically studying books on the subject to help identify why some ideas catch on while others fall flat. His marketing-centric approach is useful for anyone looking to wield mission as part of their quest for work they love. Because of these early experiences, I looked on with curiosity, once I arrived at college, when my classmates began to wring their hands about the question of what they wanted to do with their lives. For them, something as basic as choosing a major became weighted with cosmic significance. I thought this was nonsense. To me, the world was filled with opportunities like Princeton Web Solutions waiting to be exploited to make your life more interesting—opportunities that had nothing to do with identifying predestined dispositions. As my quest continued, therefore, it became clear that I needed to introduce some practical strategies into my own working life that would force me to once again make deliberate practice a regular companion in my daily routine. To combat this resistance, I deployed two types of structure. The first type was time structure: “I am going to work on this for one hour,” I would tell myself. “I don’t care if I faint from the effort, or make no progress, for the next hour this is my whole world.” But of course I wouldn’t faint and eventually I would make progress. It took, on average, ten minutes for the waves of resistance to die down. Those ten minutes were always difficult, but knowing that my efforts had a time limit helped ensure that the difficulty was manageable. The second type of structure I deployed was information structure—a way of capturing the results of my hard focus in a useful form. I started by building a proof map that captured the dependencies between the different pieces of the proof. This was hard, but not too hard, and it got me warmed up in my efforts to understand the result. I then advanced from the maps to short self-administered quizzes that forced me to memorize the key definitions the proof used. Again, this was a relatively easy task, but it still took concentration, and the result was an understanding that was crucial for parsing the detailed math that came next. My Research Bible Routine At some point during my quest, I started what I came to call my research bible, which is, in reality, a document I keep on my computer. Here’s the routine: Once a week I require myself to summarize in my “bible” a paper I think might be relevant to my research. This summary must include a description of the result, how it compares to previous work, and the main strategies used to obtain it. These summaries are less involved than the step-by-step deconstruction I did on my original test-case paper—which is what allows me to do them on a weekly basis—but they still induce the strain of deliberate practice. My Hour-Tally Routine Another deliberate-practice routine was the introduction of my hour tally—a sheet of paper I mounted behind my desk at MIT, and plan on remounting at Georgetown. The sheet has a row for each month on which I keep a tally of the total number of hours I’ve spent that month in a state of deliberate practice. My Theory-Notebook Routine My third strategy was the purchase of the most expensive notebook I could find at the MIT bookstore: an archival-quality lab notebook that cost me forty-five dollars. This notebook boasts a nice thick cardboard cover, mounted on double-wire spirals, that falls open flat. The pages are acid-free, thick, and gridded. I use this notebook when brainstorming new theory results. At the end of each of these brainstorming sessions I require myself to formally record the results, by hand, on a dated page. The expense of the notebook helps signal the importance of what I’m supposed to write inside it, and this, in turn, forces me into the strain required to collect and organize my thinking. The result: more deliberate practice. The insights of Rule #2 fundamentally changed the way I approach my work. If I had to describe my previous way of thinking, I would probably use the phrase “productivity-centric.” Getting things done was my priority. When you adopt a productivity mindset, however, deliberate practice-inducing tasks are often sidestepped, as the ambiguous path toward their completion, when combined with the discomfort of the mental strain they require, makes them an unpopular choice in scheduling decisions. By the time I met Lightman, he had shifted to an adjunct-professor position, providing him even more freedom in his schedule, and had crafted for himself an impressively unburdened life of the mind. He now teaches writing courses that he designed and that focus on issues he thinks are important. He has freed himself from the need to be constantly seeking grant money or publications. He spends his summers with his family on an island in Maine—a location with no phone, TV, or Internet—presumably thinking big thoughts while basking in the sublimity of his surroundings. Most impressive to me, Lightman’s contact page on his official MIT website gives the following disclaimer: “I don’t use e-mail”—a move toward simplicity that a less famous academic would never get away with. True missions, it turns out, require two things. First you need career capital, which requires patience. Second, you need to be ceaselessly scanning your always-changing view of the adjacent possible in your field, looking for the next big idea. This requires a dedication to brainstorming and exposure to new ideas. As explained in Rule #4, an effective strategy for making the leap from a tentative mission idea to compelling accomplishments is to use small projects that I called “little bets” (borrowing the phrase from Peter Sims’s 2010 book of the same title). As you might recall, a little bet, in the setting of mission exploration, has the following characteristics: It’s a project small enough to be completed in less than a month. It forces you to create new value (e.g., master a new skill and produce new results that didn’t exist before). It produces a concrete result that you can use to gather concrete feedback. This time, however, he approached his working life with a new awareness. His experience at the monastery had freed him from the escapist thoughts of fantasy jobs that had once dominated his mind. He was able instead to focus on the tasks he was given and on accomplishing them well.